so there's that all cut out. 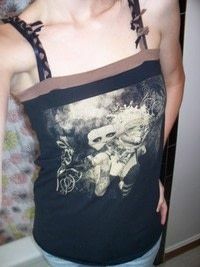 also, not pictured, i cut off the hem at the bottom and rounded it off for a feminine look. i like that unfinished look, but you can keep your hem if you want, cut yours rounded off and hem it at the end, or whatever. 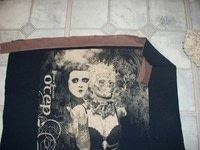 next, cut out 2 strips of scrap t-shirt material in a contrasting color, to be a band that goes around the top of the tank. 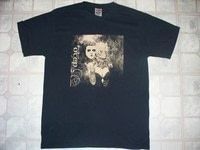 or do the same color as the main part of the shirt. or you don't have to do this part at all. i literally made this all up as i went along; feel free to do the same :) if you do these bands, make sure they are a bit longer than the width of the top of your tank, just so you know you have enough. we trim it off later. then fold them in half (wrong sides together) length-wise and iron. 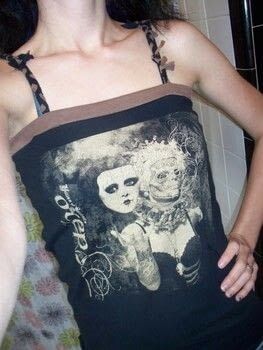 now take one of your shirt pieces (either the front or back) and lay it right side up and pin this band to it. you want your raw edges to meet. 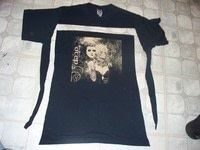 now do the other shirt piece. now sew them together right at that raw-edge. 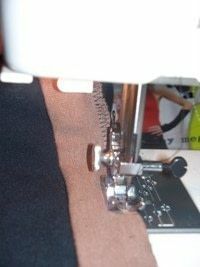 i used a zig-zag stitch because i felt it would be stronger (i don't have a serger). also, my machine was already set at zig zag so i took it as a sign to just keep it. (i'm lazy, i can imagine anything as a sign for me not to have to do more work than necessary.) after sewing the band at the top, flip the band piece up and iron to hold it in place (sorry no pic of that). 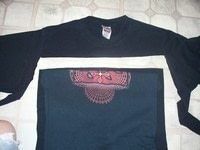 now get both your front and back shirt pieces and put them right sides together and sew up the sides. cut off the extra pieces of the band. 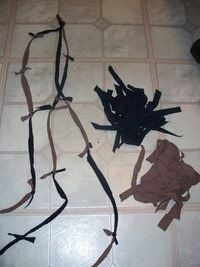 now we need to make the straps! to complement the messy-shirt style i like so much, i decided on braided straps. 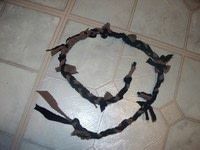 not just any braided straps, but braids made from scraps of shirt tied together. 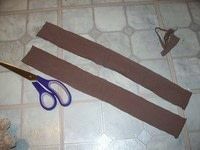 so i cut some skinny strips of fabric from both the brown and black fabric. each piece is about half an inch wide and anywhere from 4"- 8" long. then i tied those tiny strips together into 6 long strands (3 for each strap we're gonna braid), alternating and not alternating colors as i saw fit. 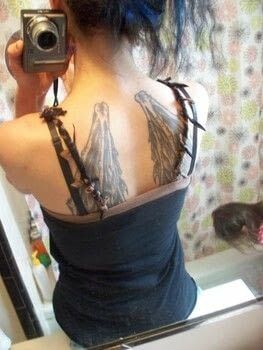 you could do just super long strips braided, too. here's one of the straps braided. tie it off at the top and the bottom just so it doesn't come undone. have some patience with braiding, those knots get in the way and make it get all tangly, but go slow and easy and work around those knots, keeping the ends out so they stick out everywhere for a messy look. okay now we need to sort of reinforce that strap a bit, cos i felt that if i left it as-is, that band would keep wanting to flip down and drive me nuts. but i also didn't want any stitches showing through the brown band if i stitched through the braid and band. so, since the band is 2 layers thick, i decided to hand-stitch through only the back side of the band and the braid. i am terrible at hand-sewing! but it worked well, so do that for all 4 spots.